Bruce Springsteen FAQ: All That's Left to Know About the Boss, by John D. Luerssen. Foreword by Pete Yorn. 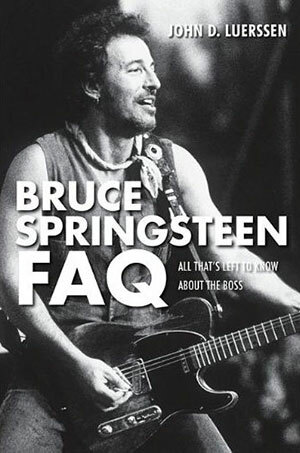 Part of the FAQ series from Backbeat Books, this compendium of Springsteen facts, despite the title, is not actually formatted as a Frequently Asked Questions list. Rather, it presents (roughly) chronologically ordered, easily digestible bites tracing Springsteen's story from birth to the release of Wrecking Ball. Sort of a biography, but for short attention spans; or like an encyclopedia, but not alphabetically arranged... crossed with The Book of Lists... crossed with Uncle John's Bathroom Reader. Luerssen says he wrote Bruce Sringsteen FAQ -- his second for Backbeat's FAQ series, after his U2 FAQ -- with the goal of delivering "the only Springsteen book you'll ever need." You could certainly do worse. Balancing the essential facts with lesser known anecdotes from childhood ("St. Rose of Lima Struggles"), his teen band years ("Rockin' the Insane Asylum"), Steel Mill ("Swim Club Riot"), signing to Columbia ("The Esquire"), his lawsuit against Mike Appel ("The Depositions") and the album that never was (The Ties That Bind), Luerssen packs a lot of information between these covers. When did Bruce first befriend Little Steven? Who were Ooze and Oz? How did Springsteen avoid Vietnam? How did Bob Marley come to support him in 1973? Who leaked "Born to Run"? What led to Springsteen's 1975 panic in Detroit? What was the original title of Darkness on the Edge of Town? Who is "The Chicken Man" referenced in "Atlantic City"? How did Springsteen first meet Patti Scialfa? How did Bruce fire The E Street Band in 1989? What set 1999's "Reunion Tour" in motion? What classic song did Bruce sing at Clarence Clemons' private memorial? Luerssen answers these questions and countless others in this entertaining if haphazard gathering of Boss facts, figures, stories, and minutiae gathered from a wide variety of sources. Backbeat Books/Hal Leonard, softcover, 438 pp., with B&W images of releases and memorabilia.